An explosion occurred outside the al-Arish Police Station in North Sinai on Sunday afternoon leaving five policemen and a civilian killed, the Interior Ministry said. The Ministry said in a statement that a truck attempting to break into the police station was faced with security forces who fired at it, causing it to explode; the truck’s driver was instantly killed. It added that a number of policemen and civilians were also injured in the incident, yet without providing a toll. 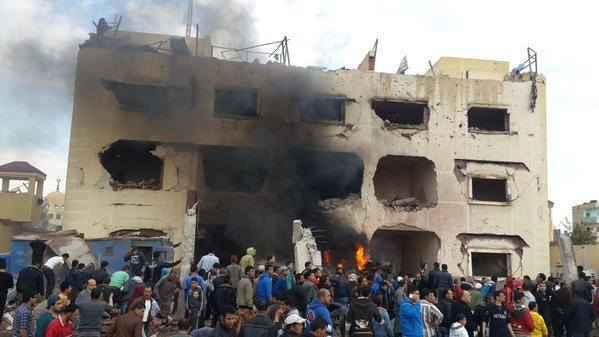 This is the second explosion to hit North Sinai today. A military vehicle exploded on a road in North Sinai’s Sheikh Zuweid earlier on Sunday, leaving six military personnel killed and two more injured, the armed forces spokesman said. Sinai-based Ansar Bayt al-Maqdis, Egypt’s most active militant group, claimed responsibility for both attacks on a twitter account believed to belong to the group. Militancy inside Egypt has seen a significant rise since July 2013, since the military ouster of Islamist President Mohamed Mursi, following mass protests against his rule. Most attacks target security forces in North Sinai. Ansar has claimed responsibility for most militant attacks carried out in the governorate since 2013. The group pledged allegiance to Islamic State fighters in Iraq and Syria last November, renaming itself as the “Sinai Province”. Security forces killed over 300 suspected militants in security campaigns in North Sinai during the months of February and March, the armed forces spokesman announced in a number of separate statements.